What is a BBQ Rub? I get that question all the time from co-workers and friends. It seems that some folks either just don’t understand rubs, or are afraid of them. Basically a “rub” is a blend of herbs and spices that add to or enhance a meat before, during, or after cooking. Most rubs usually have a sweet component (sugar, brown sugar, turbinado sugar), a salty component (kosher salt, sea salt), a savory component (herbs) and/or a spicy component (black pepper, chile powder). You can easily make your own rubs at home with some basic ingredients you already have on hand, but that will be a whole other post sometime. Dry rubs are sprinkled onto meats (usually with a heavy hand), with the meat being grilled or smoked as is. 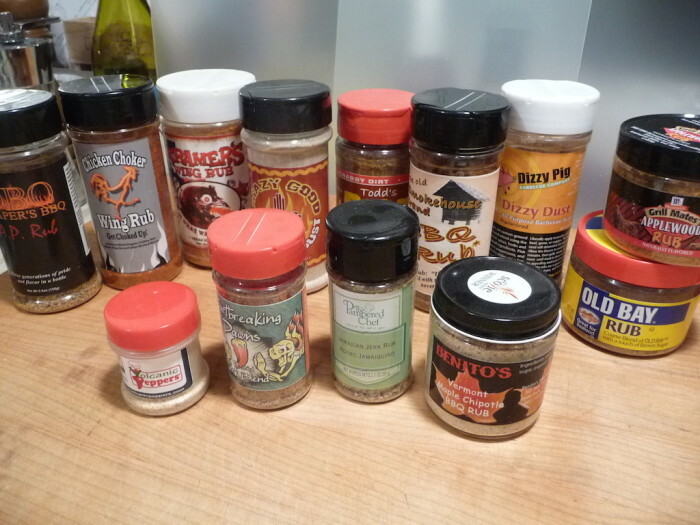 Other rubs call for a marinade of sorts – usually involving the rub and a liquid (usually oil), and time – in a baggie or a covered dish or bowl or baking dish. Finally, some rubs call for that same heavy dusting onto the meat before it is grilled or smoked, then adding additional rub sprinkled on during the cooking process – I do this with wings and ribs. Rubs and their ingredients and flavors can be a very personal thing. Some like a light flavor (leaving room for the smoke wood or BBQ sauce to shine) – and some like a heavy dusting of rub to bring the flavor of the spices to the front. Then there is the camp that has a perfect combo of rub and sauce – usually under the same name – that brings on the flavor, spice and taste and texture for a finished product. This is rare, and if you find it or hit upon it, you have gold. 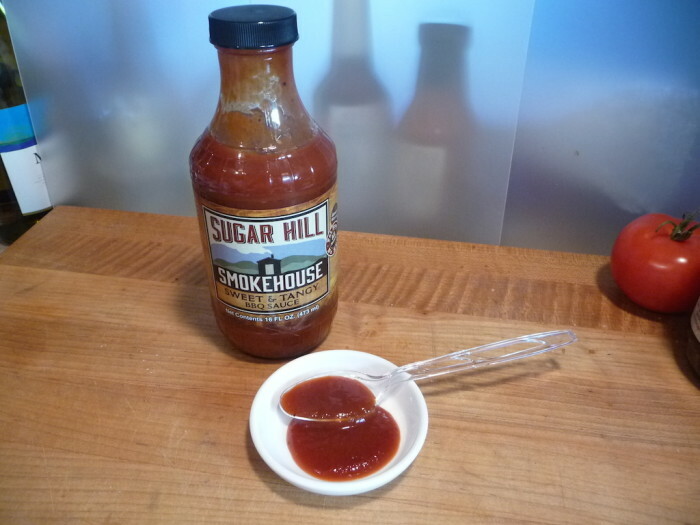 We do so many reviews here at HotSauceDaily that we don’t usually mention our favorite BBQ sauce or rub – actually, we don’t really have a “go to” sauce or rub because of all the review products. But, Marilyn and I agree, that Draper’s BBQ Sauce and AP Rub are the epitome of a sauce and rub that just go great together. Where can I buy rubs? At the store: Thanks to the ever growing “foodie” movement, entire TV channels devoted to cooking, and the never-ending backyard grilling scene, your local grocery stores now have a large collection of rubs, ready to use. Paul Prudhomme, McCormick, Stubb’s are just a few names. Look around in the spice section – you’ll be surprised. Did you know Old Bay has a rub too? And a Blackening Seasoning as well. McCormick, that venerable spice house from our own state of Maryland, has a delicious and amazing array of rubs, marinades and spices that are in more and more grocers all the time. Online: You can start by searching our RUBS archive right here. They are all top notch products. Do a Google search for rubs, and be prepared to fall into a hole. Last I looked “bbq rubs” yielded 3.4 million results, and “rubs” were about 12.5 million results! 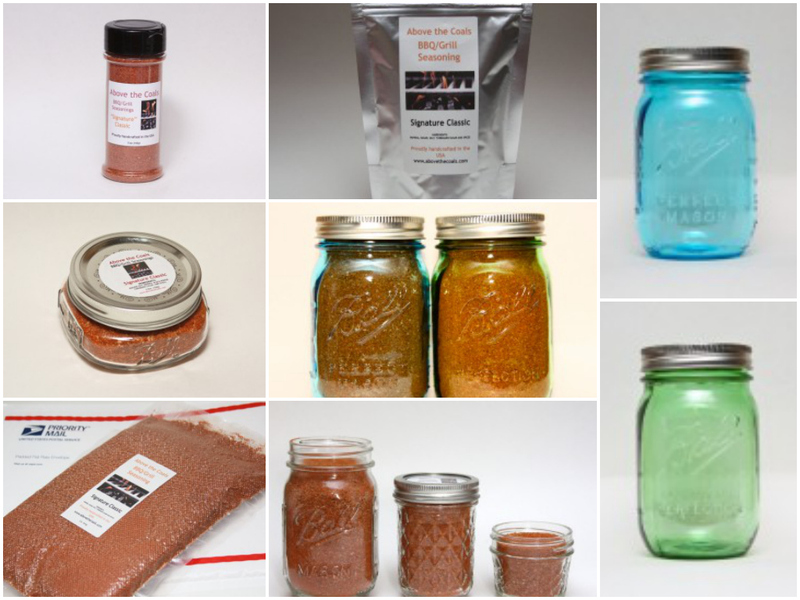 We’ll save you a little time and point you to some flavorful and useful rubs that you can order online, from small batch makers to some big dogs. I was afraid of this. There are so many excellent rubs available online, that there is no way we can talk about a dozen or so, without leaving someone out of the list. But this short list is a great starting point. Keep in mind, some of these rubs are from hot sauce makers, some are from BBQ sauce makers, and some are specialties of both or all three. Titles/names are linked to their sites for your shopping pleasure. Above the Coals – Featuring hand packed, by order rubs and spices, our newest favorite rub(s) are from Above the Coals. 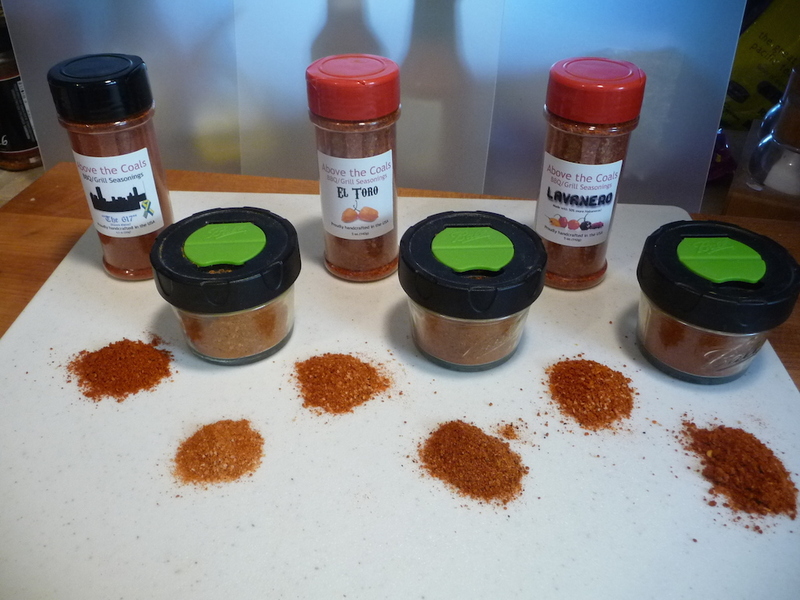 Chris Kulturides has a line of 6 seasonings that are just stellar. If you BBQ at all, you need to check out his rubs and seasonings. Above the Coals lineup includes Signature Classic, 2 Alarm, Carolina Heatwave, The 617, El Toro, and Lavanero. And as a bonus, the packaging options include shaker bottles, foil pouches, Mason jars, and bulk packaging. Chicken Choker Wing Rub – From NorCalBBQ – Fiery hot. Sprinkle lightly. Our review is here. Kramer’s Wing Rub – another wing specific rub that rocks. We gave it 4 stars ★★★★☆ here. 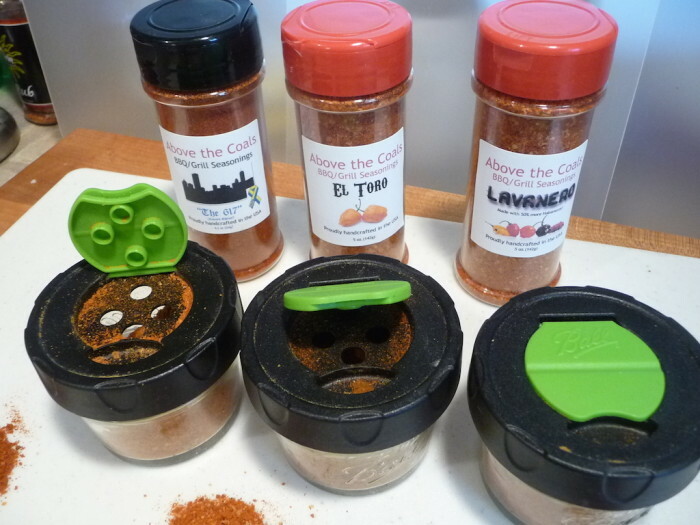 Crazy Good Red and Green Rubs – We awarded the Green Chile Dust 5 stars ★★★★★ and love the Red Chile Dust just as much. Todd’s Dirt – a HUGE favorite in our house, and it will be in yours as soon as you taste them. Original, Crabby, and Bayou seasonings are out of this world good. Our ★★★★★ rating still stands. We reviewed Bayou here, and his Crabby Dirt here. Dizzy Dust – If we had ONE rub that we do reach for often, it would be Dizzy Pig’s Dizzy Dust. Our posts have been mostly about Dizzy Pig Dizzy Dust on pork tenderloins. Grill Mates Applewood Rub – One of the many Grill Mates products that McCormick Spices has out now. They are all good! Old Bay Rub – I mentioned this earlier. Again, another stalwart of seasonings, Old Bay, have released a “rub” version of their flagship spice. Rounding out the rubs in the front of the pic are Volcanic Peppers, Heartbreaking Dawns, Pampered Chef, and Benitos. All worthy of your consideration and purchases. Johnny Secreto.com – One last company I want to mention, only because I think their rubs are delicious, is Johnny Secreto out of Michigan. I really dug their rubs, but sadly, I’ve never heard back from them at all. After the reviews, and emails… nothing. But the rubs are awesome, and I share that with you, the reader, because I want you to have a good experience and and enjoyable meal. Well, that certainly is a great list to start with, and as you play around with rubs and spices, you’ll come to know what you like. Ingredients: tomato paste, water, vinegar, sugar, prepared mustard, molasses, salt, liquid smoke, onion powder, paprika, garlic powder, spices, serrano pepper mash, cayenne pepper mash, tamarind extract. We smoked 4 racks of baby back ribs to test out three BBQ sauces and a dry rubbed rack. 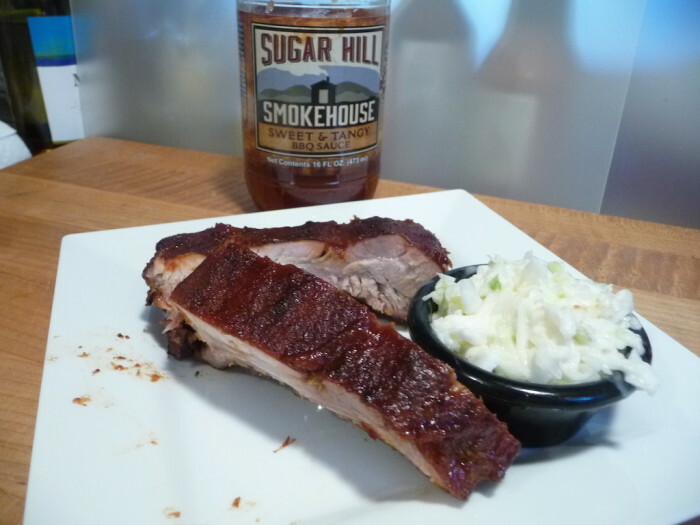 How did Sugar Hill Smokehouse Sweet and Tangy turn out on the ribs? Well… we think pretty darn good. Read on. Texture and Appearance: The color is dark red, and the consistency is almost like a tomato sauce, or tomato puree – a fairly thick texture. The fine grind of ingredients presents a nice sauce that has a good body that is flecked with tiny bits of pepper and spices. Classic. Taste Straight Up: A sweet, tomato-y flavor is up front with just a hint of vinegar. It’s not overly sweet, but does impart a homemade flavor. Surprisingly, the vinegar flavor is mild – not overbearing. Considering the ingredient list includes serrano and cayenne pepper mashes, I was surprised that the spiciness of this sauce is subdued. The more you eat, the more the chile pepper tingle shows up – but only slightly. Aptly named – it’s more sweet than tangy. Sweetly simple. Our baby back ribs were started in the oven at 275º for about 90 – 120 minutes – then we moved them onto the smoker to finish cooking and get layered with sauces. By the way, have you heard about Unox XEVC-2011-EPR? It’s an Electric Combi Oven that can be used for roasting, grilling, steaming and baking. For more details about this product, you can go to ianboer.com.au. (Smoking at 230 – 250º for another 2 hours.) This is a great time-saver for the backyard cook, as no one will ever know you started the ribs in the kitchen! Taste on Ribs: Great sweet flavor. The sweetness held up nicely, but in the end, the tang was lost on us. As for smokiness – we did pick up on our own peach wood smoke, but the liquid smoke was a tad overbearing. Lesson learned: If there is any liquid smoke in a sauce, we do not need to add more to that by using wood chunks. Sugar Hill Smokehouse Sweet and Tangy caramelized nicely, held its body, and ultimately had a dull, matte finish. Very appealing. Final Thoughts: – We’re so close to a 4 star rating, but have to deduct for the strong liquid smoke flavor. Normally, I don’t mind a little bit of liquid smoke, but in this case I’d like to see Sugar Hill cut back on the smoke, and kick up the “tang” factor. This BBQ sauce is worthy of keeping on hand anytime – it’s remarkably useful with an authentic BBQ taste. And we can assume it tastes just as good on chicken and pulled pork. 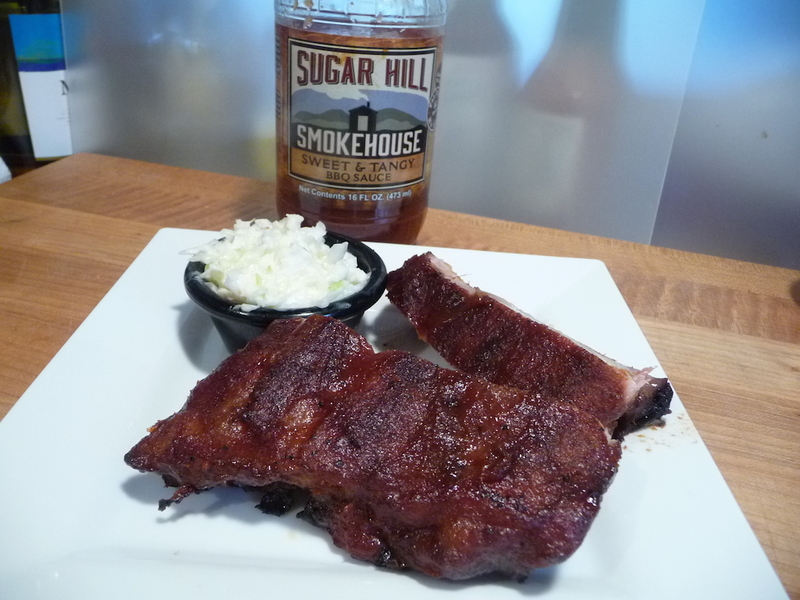 You can find Sugar Hill Smokehouse Sweet and Tangy on Facebook and Twitter and you can order online from them at http://sugarhillsmokehouse.com. 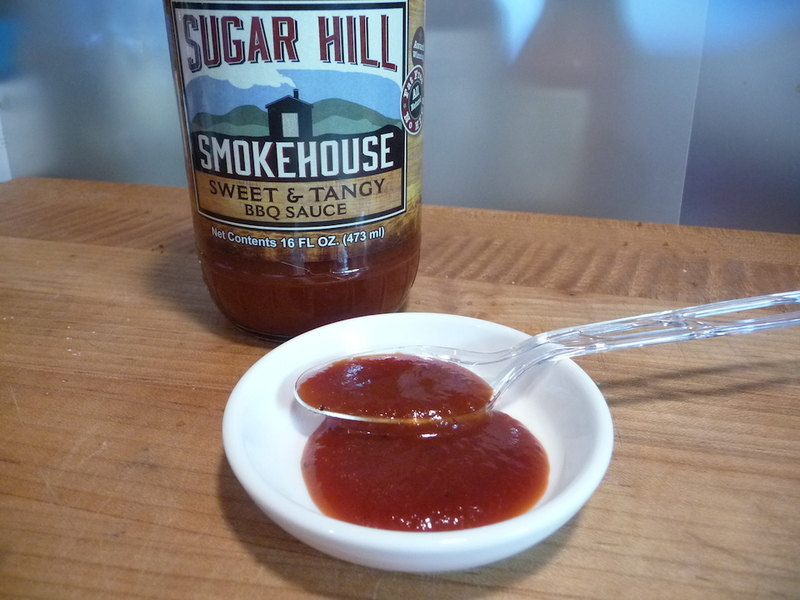 Are you a sweet and tangy BBQ sauce lover? Or are you more of a vinegar sauce lover? Maybe you like your BBQ sauce totally different than anything above… Leave a Comment below and let us know.